● The only one day Monument Valley bus tour. Also goes to Antelope Canyon and Horseshoe Bend. This is a very long day. You depart Las Vegas at about 5 a.m., and get back about 18 to 19 hours later. If you would prefer a shorter Monument Valley tour, please consider the Monument Valley air/ground tour. The tour heads north out of Las Vegas, up Interstate 15, into Arizona, and through the Virgin River Gorge. At the top of the Gorge you enter Utah to the south of the small town of St. George, where there is a refueling and comfort stop. At the even smaller settlement of Hurricane we leave the freeway behind, and travel through the twin towns of Hilldale and Colorado City, on the Utah/Arizona border, where polygamy is still practiced. After passing through Kanab, we proceed through the Grand Staircase-Escalante National Monument, before reaching Page, on the shores of Lake Powell. This is where the fun really starts, as you leave on a Navajo (Indian) led, off road, tour of Antelope Canyon, with its amazing colors, textures and rock formations. The road to Monument Valley travels across the Navajo reservation, and as you get closer to the tribal park you will start to see the mesas, buttes and other rock formations for which the region is so famous. 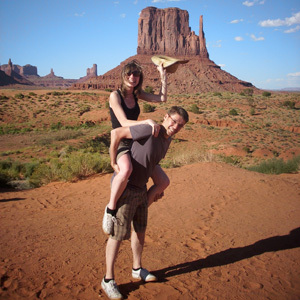 At Monument Valley there is an optional back country tour, which is also led by a Navajo. if you choose not to do that, you will check out the sights and vistas from the Visitor Center area. After returning to Page there is an easy hike to Horseshoe Bend, which is an amazing view of the Colorado River, as it twist its way around a butte in the river. You will take in this view form high above, gazing down through the canyon walls. The tour ends in Vegas. Please see this one day Monument Valley bus tour in a lot more detail.